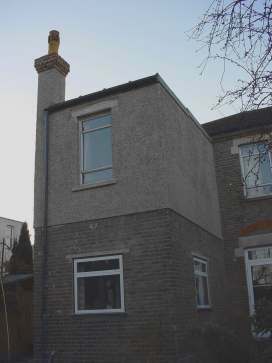 The pictures below show the project through to completion. Day 1 of Phase 2, and a start has been made on removing paint covered pebble-dash. Progress with cold chisels and bolsters is painfully slow and very damaging to the bricks. 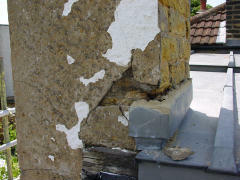 On Day 2, the main route for water entry was confirmed; 'live' paint over 'live' and deeply damaged render allowed water to penetrate this chimney and soak down into the house. The paint had hidden the problem and stopped any evaporation. 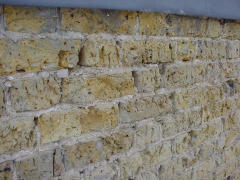 The use of a power chisel was much faster; however, re-rendering will still be needed. On Day 4 it became clear that the slow progress on Day 1 was because the cement render on that wall was a stronger mix; it had bonded very well to the bricks below. 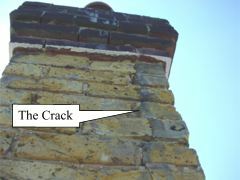 And the Troublesome Chimney was found to require urgent attention to prevent it splitting in half. 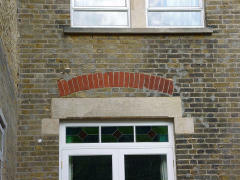 At the end of Day 13, the damaged brickwork is nearly all protected, and a poultice type of stripper on lintels and cills is ready to be removed. Days 14 and 15 have been spent rebuilding the damaged chimney. 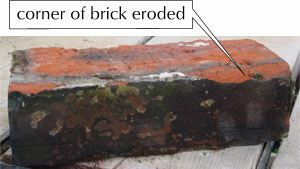 This brick has been damaged by repointing with cement mortar. After removing the poultice stripper, the result was very satisfactory. A second coat will be applied to small areas. Now the scaffolding has gone and Phase 2 is completed, you begin to get a feel for the final finish. 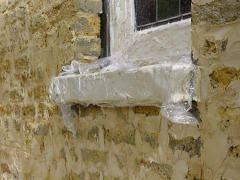 The lintels and cills are a revelation; why people paint them is a mystery - the stone is a wonderful honey colour. 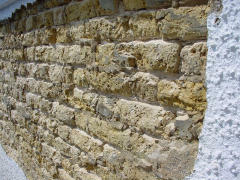 In the short term, the largest pointing holes will need filling, and experiments will establish the best way to remove cement mortar buttering the face of some small areas of brickwork. 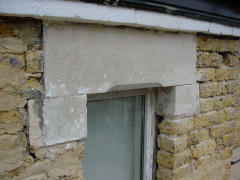 Much of the first storey has now been re-pebbledashed with a 6:1:1 mix, in other words incorporating lime. 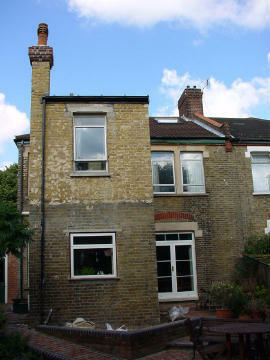 Longer-term projects will include replacing the horrible aluminium and plastic windows!